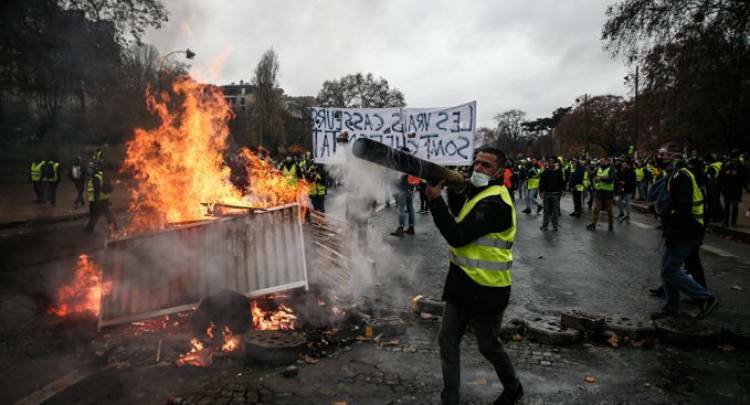 PARIS: The French government will suspend its plan to introduce a fuel tax hike which has led to violent protests, the media reported on Tuesday. The tax on petrol and diesel, due to increase next month in a move towards cleaner fuels, sparked protests that quickly escalated to reflect a range of grievances including the marginalization of rural areas, high living costs and general anger at President Emmanuel Macron's economic policies. The demonstrations hit major French cities causing damage for the past three weekends and claimed three lives, the BBC reported citing the French media. Earlier, Prime Minister Edouard Philippe sought a compromise with the protesters, but they called off talks citing death threats from extremists in their ranks. He was due to meet Cabinet ministers to agree to a response to rioting, looting and destruction in Paris amid the "gilets jaunes" (yellow vests) movement. The movement is called "yellow vests" because the protesters took to the streets wearing the high-visibility yellow clothing that is required to be carried in every vehicle by French law. The protest movement has broadened its demands to include Macron's resignation and the dissolution of the French Parliament, the Guardian reported. Macron repeatedly vowed not to give in to street rule but has been forced to reconsider after the worst violence in Paris in half a century. He has accused his political opponents of hijacking the movement in order to block the reforms. Nearly 300,000 people took part in the first countrywide demonstration. There were more than 106,000 a week later and 136,000 people last Saturday. Protests continued on Monday. About 50 "yellow vests" blocked access to a major fuel depot in the port of Fos-sur-Mer, near Marseille, and petrol stations across the country have run out of fuel. Macron has postponed a two-day visit to Serbia this week to deal with the crisis.